Stage 4. The queen stage. A little less than 160km. 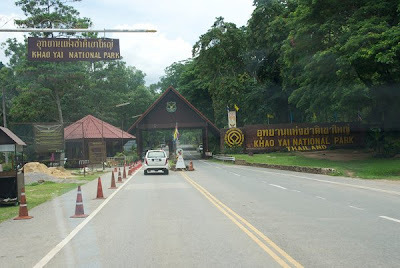 A very long false flat leading in to the first big climb then the rollers we did the day before in reverse followed by a 15km climb up a mountain through a beautiful jungle-covered mountainous national park featuring large, noisy monkeys and the odd elephant. It's probably not necessary to state once again, but it was flippin' hot and humid and sunny. Before we even started I was dumping sweat at 8am, and downing bottles of water in a desperate attempt to stay hydrated. The night before I was given a yellow jersey as the overall GC leader for the elite category. I had a little over one minute time advantage on 5 riders directly behind me, and quite a bit over the remaining riders. Today was when the overall winner would most likely be decided. Today all I had to do was stick with the guys near me on GC, and respond to any attacks on the last climb. The pace started out slow and easy on the highway. We hit the first of two big climbs, and a strong rider named Fredrik Croneborg led the way. He set a tough pace, and quickly dropped everyone but about 10 riders. One guy was up the road from the Racing Force team, and he had two guys in my group, and eventually John Tonks from CS Racing and Fredrik went up the road to join him. So that left me with the other 3 from CS Racing, the two Racing Force guys, and a few others that I'd later learn had no incentive to help take some pulls in the front. I had one teammate with me, Wade Wallace. Wade and I had different opinions on what was needed to be done given the current situation, but since I wasn't confident in my own assessment, I didn't press the matter for the time being. He did not want to do any work up front, and was content to let the break get away. Personally, regardless of the situation, I couldn't blame him for not wanting to break the wind. It was ridiculously hot, and very difficult to work up the motivation to do any work. It was clear no one else in the break was going to offer any help so that left it up to me. For my part, I decided I'd not do any work either, but on occasion did pick up the pace when we got down to an embarrassingly low speed. And then things got interesting. We were cruising along leisurely with the break a little over a minute ahead, when my rear spoke popped. I was borrowing some fancy carbon clincher wheels for the day from my teammate Rob Gitelis, and they were nearly brand new! My teammate in the break, I learned after the race, without my consultation, decided I'd get a wheel change quickly so continued on with the group. I was left alone on a nice and warm country road surrounded by mountains, basking in the late morning sun with no wheel in sight. I stood there for a few minutes frustrated, and finally the scooter with the wheels arrived. 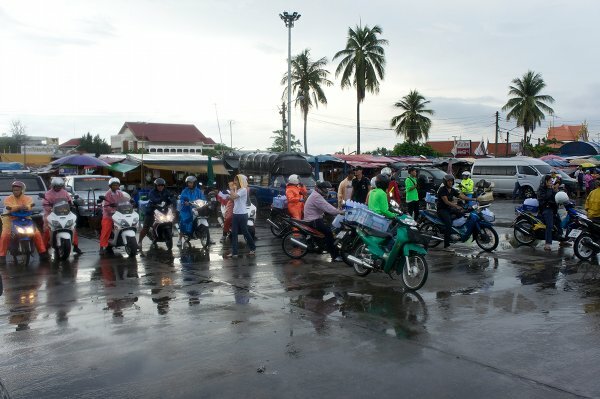 The rules for this race allowed motor pacing back to the group you were in when the incident occurred, but the scooter disappeared and offered no help. Now even more frustrated, I continued on, but not at a very hard pace, resigned to let the group behind me catch me, or perhaps a scooter would show up to pull me back to the lead group. I was feeling sorry for myself, but I was also ticked off that my teammate did not stop to offer help. I also think my expectations were set a bit too high for this race. It's not like I'm used to being catered too when I race, but my team in the States this year has gone out of their way to make sure I keep pedaling my bike. After about 10km, a new scooter appeared and started to help me. How he knew I belonged in the lead group I'll never know, but I was grateful for the push, and after a few minutes at 70km/hr I quickly rejoined the group. Back to the game of who's going to do some work. I had decided I was not doing any GC be damned. So I rode with my hands off the bars at about 20km/hr talking with my buddy Darren Benson from CS Racing. The two CannAsia guys in the break finally decided they needed to do some work to maintain their GC position so the pace picked up. And right before the climb I got another flat, and to make matters worse the CS Racing team had just attacked. This time my teammate stopped, and gave me his wheel. It should be noted he apologized profusely after the first incident, and clearly felt terrible for what had transpired. Wade saved the day this time, and I'd probably not have finished as I did had he not been there! Everything went as smooth as could be for a wheel change as the scooter stuck around this time and returned me to the lead group. Back in the group, the guys remaining were thinking their work was done for the day so that left me to do all the work. Left with no other options but to ride hard, I picked up the pace. Finally the park and the climb. The hill quickly whittled away the group. The pace I set dropped everyone besides one CS Racing rider named Simon. He was the one I was most worried about throughout this stage race. A pro continental rider for Champion Systems Asian team, he's short and skinny, and I could only assume he was their climber. The road kept getting steeper, and he blasted by me during one of the switchback sections. I basically waved good bye. There was no way I could keep that pace. I went around a few more switchbacks by myself, and to my surprise there Simon was with the rest of the leaders. I joined the group, and recovered for a few minutes, and debated just riding with them since that was all I really needed to do to maintain my overall lead. But I just can't do that. I moved to the front and started going hard. I pulled away from them, and no one tried to come with me. I was really surprised Simon did not tag along, but I ended up gaining nearly 7 minutes on him by the finish. I never saw the group again, and finished solo with a gap of nearly 2 minutes on 2nd place! At some point I registered the jungle sounded incredibly alive. Chirps, screams, and howls were all around me. 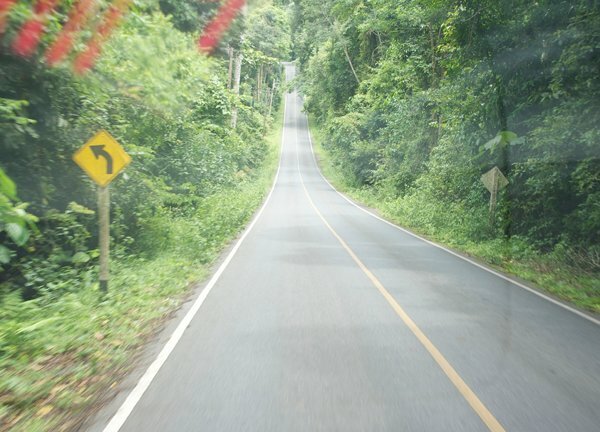 Later, riders told me they saw large monkeys in the trees, and huge piles of elephant dung on the road, something I definitely missed, and also a sign warning of their potential crossing. Maybe next time! The effort required for the climb completely wasted me. My feet were tingling numb and what feeling remained felt like fire, and I was overheating big time. I jumped off my bike as fast as possible, tossed off my shoes, helmet and jersey, and called out for some cold water. It took a few minutes, but it came, and it was oh so nice. 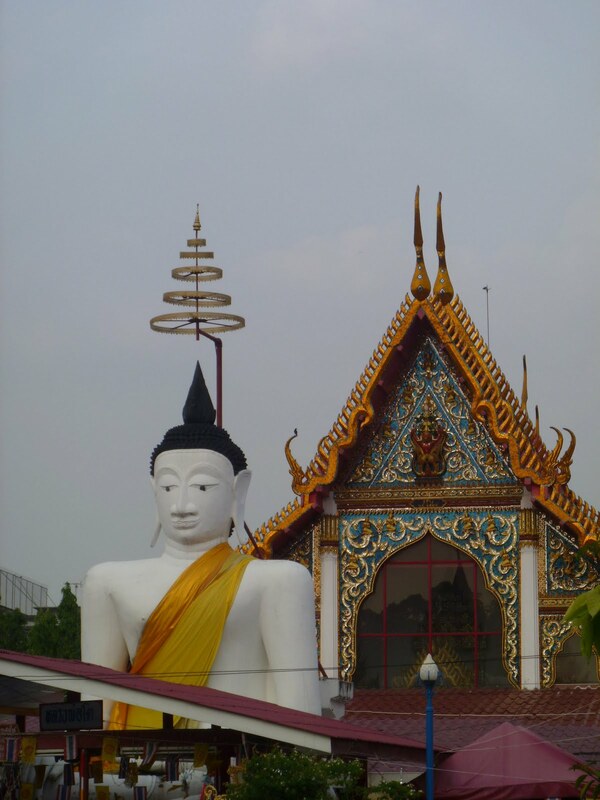 With the GC clinched baring any major mishap, it was time to relax and enjoy Thailand! Only one short stage remained, and it was completely flat with a small 2km climb at the finish. 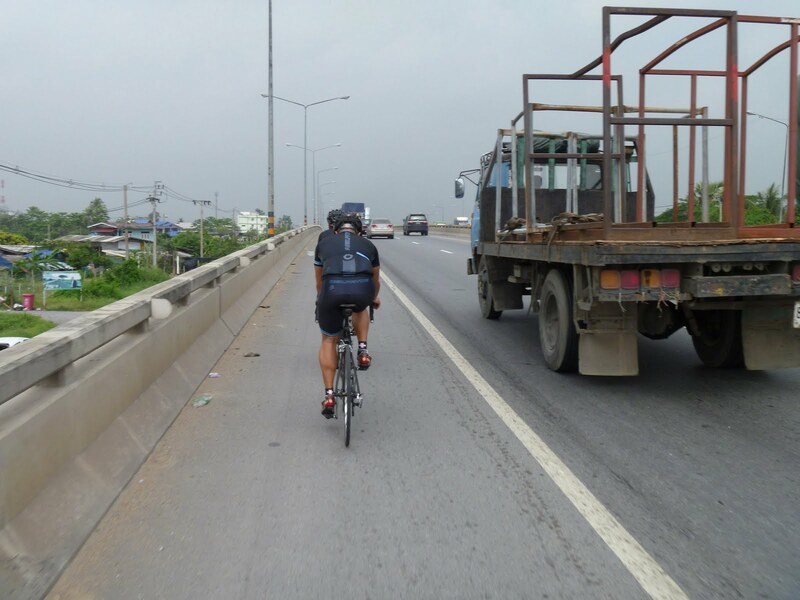 After a great first visit to Bangkok, I awoke feeling rested and was ready to tackle another hot day of cycling. Today's stage 2 was mostly flat with a small climb at the end. Unfortunately it was raining before the start, and it did not look like it was going to clear up any time soon. We were transferred from the hotel to the start, a roughly 30 minute drive. The organizers did an incredibly good job dealing with the movement of 200+ bikes each day. They had semi-sized trucks loaded with bike carriers that they loaded each night in to the wee hours of the morning. Our rockin' luxury van. It had a huge, bumping custom sound system and mood lighting. I had no interest in rubbing shoulders with riders of varying degrees of experience on slick roads, so I told the few guys who I thought would be GC contenders I had full intentions of breaking away early on if the rain held. It did. So we broke away. the start of the race. the orange truck is one of the bike carriers. The roads truly were flat, but unfortunately they were on highways that were not blocked from traffic. The race officials did a nice job keeping traffic away from us, but it was still a bit nerve racking having vehicles buzzing by at high speeds especially considering the conditions. Did I mention it was still raining? Well, it was. The skies turned darker as the km's accumulated, lightning lit the sky in the distance - right where we were heading. The rain came down harder and harder. I was in a break with about 8 guys. I can only imagine what it was like in the peloton a few minutes behind us. 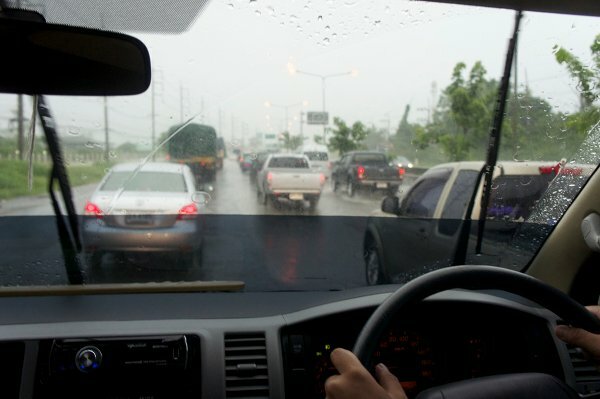 This is taken from our van behind the race, but we had to ride through this as well in the pouring rain!! The roads began to flood. We went through puddles that went over our bottom brackets. I began to worry about what I was drinking off the road. What seemed like gallons of nasty liquid was being sprayed in my face off the wheel in front of me. Visibility was near zero. The rain felt like needles pricking my skin. Huge gusts of wind came from the side making things even more treacherous. Finally we turned off the highway. The rain was still coming down hard. We hit the hairpin turn to take us off the highway, and my tire felt wobbly, like I had a flat. I did my best to coast around the corner while eyeing the tire - not an easy task in this rain. The tire appeared to be fine so I continued on. On occasion, the bike felt unstable so I kept checking my tires. They seemed to be fine. Our group came to a railroad crossing where cars and trucks had slowed so we had no choice but to brake as well. Chaos ensued. The guy in front of me immediately went down, sliding...and sliding...and sliding. Two others, including my teammate Simon Kessler, pulled over saying they had flats. What the hell just happened? We weren't going that fast to warrant such a crazy slide, and why all the flats when the road seemed clean and smooth? The guy was still sliding in front of me going back and forth on the road, and I was having a hard time dodging him. Eventually I couldn't, and I ran over his leg and continued on. Sorry about that, buddy. After the race I found him, and it turned out he was fine, and he barely even had a scratch. Hoverslide..
4 of us remained. We carried on, and I eventually picked up the pace and dropped the others. I went in to TT mode and noticed my rear tire was sliding back and forth with every pedal stroke. Everything suddenly made sense. The roads were covered with a film, I assume, of diesel fuel making things incredibly dangerous. The climb began and I knew I was near the end. I picked up the pace again, but my rear tire kept slipping. Standing up was not an option in the steep sections! I got to near the top and the motorcycle official tailing me pulled diagonally in front of me blocking my way. He said "you winner." I looked around and saw no finish line. Confused. I tried to figure out what was going on from the official, and got something like 'dangerous crash on top' OK, good enough for me. I'm done. So I was left standing on the side of a winding mountain road in the pouring rain surrounded by lush, dense green jungle wondering where to go next. Clearly no car was going to whisk me away from my secluded spot. A few minutes went by, and the chase group found the two of us still trying to communicate and figure out what was going on. I explained to them the little I know - it's over, and after ascertaining the hotel location was back down the climb, I walked, then carefully rolled, down the hill back to our beautiful resort hidden in the jungle where I enjoyed a nice dinner with my teammates while Thai people performed Karaoke on a stage in front of a hundred or so of their own. and a bonus photo. Not from my group - we'd never do such a thing! Breakfast in Thailand can either be incredibly awesome, or sorely lacking depending on your requirements. Stir fried spicy noodles? Check. Fried Doughy things, perhaps similar to a donut? Check. Steamed rice and various types of stews to sample? Check. Coffee? Check. Cereal? Nope... Milk? Nope... No granola or muesli meant I was on the hunt. I eventually found a grocery down the road where I bought two pounds of muesli, and a half gallon of milk for less than what a quart of milk costs in the States. 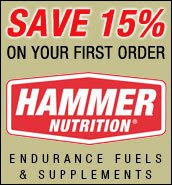 Food requirements solved, it was time to prepare for the first stage. Day 1 was a slightly less than 10km time trial on a wide, flat road with two speed bumps (small elevation gains) in the middle and near the end. The road was lined with hundreds of tall, green lamp posts with golden dragons perched atop the pole on both sides. It was hot and sunny and humid. What's hot? Probably around 35C by the time I finished my TT a little after 9am. The majority of the guys had regular road bikes with clip-on aero bars. Most had deep dish tubular wheels. A few had full on TT bikes. I had aero bars and an aero helmet, but was using shallow aluminum clinchers. My TT started off a bit bumpy. There was supposed to be a ghost rider in front of me because a team member did not arrive on time, and the guy starting everyone seemed to agree so I lagged a bit behind the start line awaiting my start time. A few seconds after the ghost rider went others started yelling for me to go. I was pushed from behind so decided I should probably go! I lost about 7 seconds at the start. Otherwise the TT went very smooth. I nailed my target wattage, and felt strong from start to finish. Afterwards, I went to the organizers and tried to clarify what happened and they said I'd have the proper time, but it turns out I did not. I ended up in 4th place overall. My teammate Simon Kessler finished a few seconds back in 5th place. Overall, Neil Pryde epic riders had a number of finishers in the top ten. With my correct time I would've had first place by three seconds. I did not press the issue since the queen 4th stage with the big climb at the end would easily trump the few seconds lost in the TT. 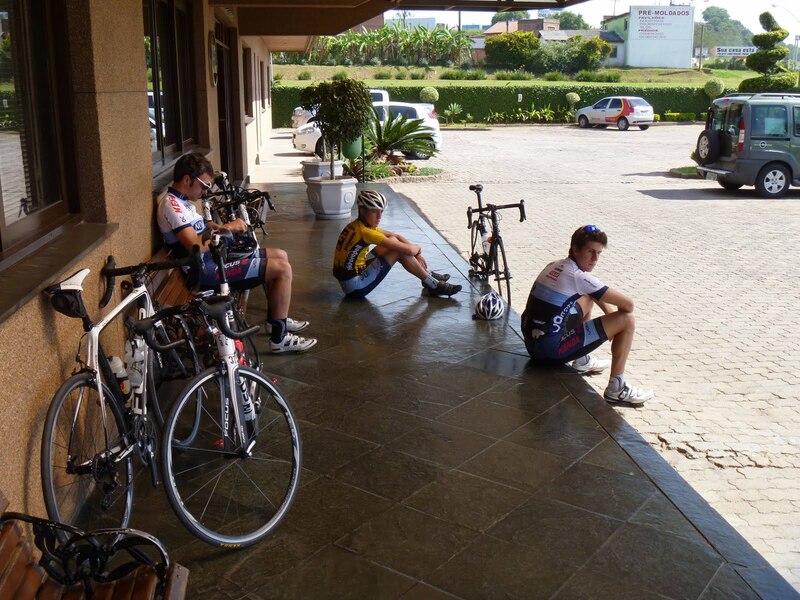 With the TT over, the Neil Pryde crew decided to pedal back to the hotel. 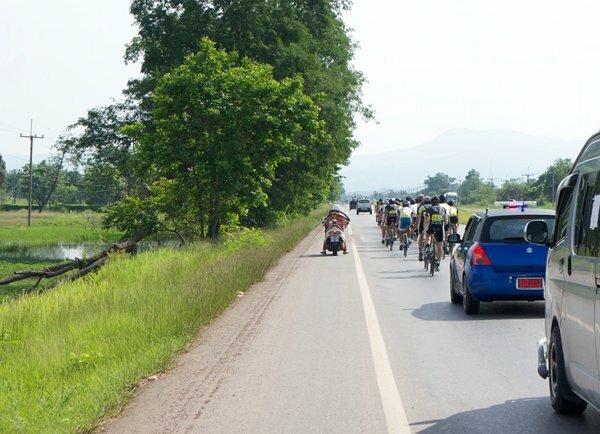 About 50km on the highway, we motor paced behind our hired van in the late morning heat. A quick shower and it was time to find some food. 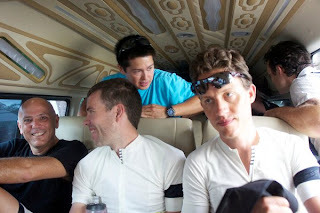 With nearly a full day still remaining, I hooked up with the guys from the Champion System Asian team, and one Neil Pryde team member, Rob Gitelis, all who I became good friends with, and headed to Bangkok on the water taxi. The taxi was the international color of yellow paint. It's quite long and holds perhaps 100 people comfortably with benches for two lining both sides. The driver sits up front and passengers disembark in the rear. Another hired gun manages the rear, whose main qualification is a superior ability to whistle above the engine noise. Using the shrill noise to alert the driver when passengers are settled, it's a rather efficient system. The taxi was relaxing and offered a relatively refreshing brief respite from the sweltering heat. It meanders from port to port along the river offering great views of the city. It's super cheap, maybe 50 cents to ride the route's entirety, and I'd highly recommend it if you are visiting Bangkok. Buddhist temples in all their gold mosaic glory sparkle alongside the river amongst grand looking palaces, modern high rise glass condos, dilapidated looking unevenly strung together shacks, and the odd single family home. Kids and dogs were swimming and splashing in the water at various intervals. We hopped off the water taxi at one point when we spotted a outdoor riverside restaurant, and had a great traditional Thai meal in a gazebo before heading further downtown. Finally, Bangkok: Crowded streets with vendors hawking every imaginable knock off consumer good. Scooters darting in every direction. Chaos. Mangy looking flea-ridden mutts hiding from the afternoon sun. Refreshing neon colored fresh squeezed orange juice. Salted fish that looked like they put up quite the fight. Innumerable unknown foods, some tantalizing others horrifying to my Western palate. What an amazing place! We strolled along a street that specialized in stainless steel jewelry, beads, stones, and custom leather footwear. One of us purchased some snazzy looking high quality Thai made wingtips for an embarrassingly low price. Our time quickly ran out, and we we had 15 minutes to make it back to the hotel for the awards ceremony of which we were the majority of the podium placers! A quick calculation was made, and we knew we'd never make it in time unless we hired a direct water taxi to the port near the hotel. We wandered past a Buddhist temple down a side street that smelled of elephant dung, and made our desperate attempt to hire a ride. The boat operator insisted on taking us for a tour before depositing us at our destination. We offered double the money for no tour. No luck. Lost in translation, we gave up and resigned ourselves to the hour long water taxi ride to our hotel. Night rides on the water are a must when in Bangkok. The palaces and temples take on a new life as the sun sets. Their gold mosaics reflect the lights of the city beautifully appearing to be artificially lit as they sparkle from every angle. A month of international racing has come and flown by, and it's back to the reality of a 9-5 job and early hours training before work. 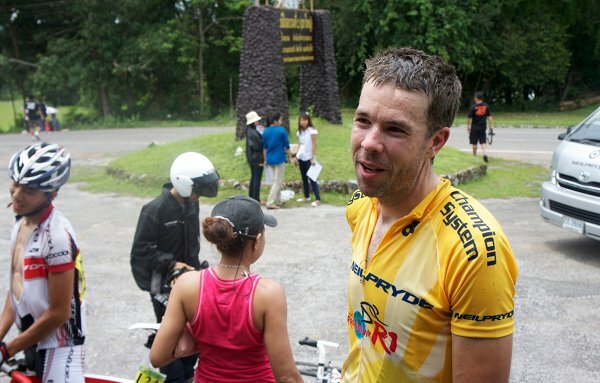 I recently returned from Thailand after participating in the five day Tour of Friendship stage race. Neil Pryde Bikes was one of the sponsors for the race, and I was there to race for them as part of their epic rider program. I was unsure what the competition would be like in Thailand, but rumor had it a few Asian pros were in attendance to spice things up a bit. I felt I was in good form after the intense racing in Brazil, and was hoping I could win the overall GC for the Neil Pryde team. I landed in Thailand at 2am after 22 hours of flying, and easily found a limo service to drag my "coffin" and my carcass to the hotel roughly an hour away from the airport. Not knowing how the taxis would be in Thailand I opted for a pre-paid limo service. It turns out I wasted some money, but it was still cheap compared to NYC taxis. I had a nice luxury SUV, and a white gloved driver to tote my belongings and deposit me safely at my hotel. 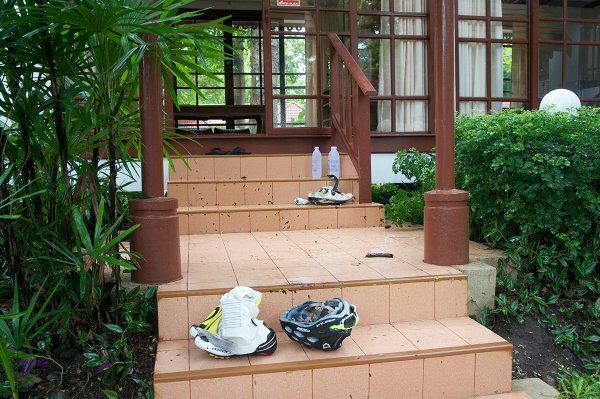 Called the Nonthaburi Palace, I had high hopes for a relaxing few days before the start of the race, but my dreams were quickly squashed as I observed the soot stained exterior walls, and drab looking carpet leading towards my room. Tiny, black bugs were everywhere inside the room along with some unseen menace, perhaps fleas, that did a number on my legs south of the knees. By the way, it was still really warm for 3am. 30C and very high humidity. Pad Thai at 3am never tasted better. I was pleased to discover Chelsea Thai near where I work in NYC was similar in taste. My first taste of local Thai food reminded me of a sunny summer day a few years ago when I was at a roof top party at a friends apartment, and I was speaking with a Thai woman who snobbishly responded about the inferior qualities of Thai food in the States when I mentioned I loved Thai food. 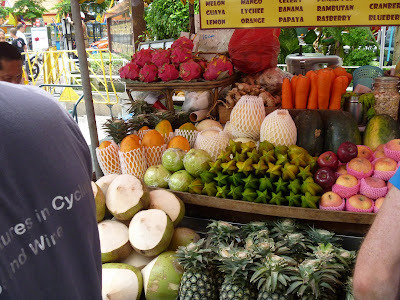 I sampled everything I could find in Thailand, and the only major differences I discovered were the cost of food, somewhat spicier dishes, and the occasional perk of fine tasting fresh fruits. But the prices really stand out. It's significantly cheaper in Thailand. But I was here to race. The next day I went for a 50km ride with some teammates. Donning the fancy, new Rapha kit we were given for the race, we hit the road on our Neil Pryde Alize's and Diablos. This was the first time I had seen a Diablo in the wild, and I have to say it looks like a great bike! Pedaling away from the hotel with Dave Christenson leading, we were quickly surrounded by traffic. And then there were flashbacks to Brazil as we navigated our way amongst the trucks and scooters on the perimeter highways of Bangkok. Hazy, hot, humid. Enough of that. Back to the hotel to eat some more, check out a temple nearby, and get ready for the racing to begin the following day. 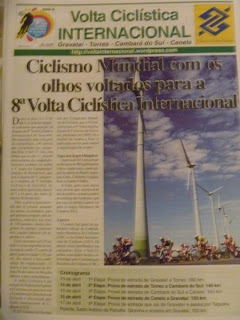 My road cycling team J.A.M Fund / NCC flew to Brazil for two UCI five day stage races early April of 2011. We started out as five, but only four could make the journey: myself, Alec Donahue, Jeremy Durrin, and Rodrigo Marchetti. Rod is the man who organized everything, and is also who got us invited down to Brazil in the first place. Kudos to him for doing an amazing job guiding us through his beautiful country. The Brazilian cycling federation arranged all of our transportation, accommodations and food. So for a brief period of time, we experienced what it’s like to be pro cyclists. None of us were ready for such a high caliber of racing, but we were approaching the race with open minds and highly anticipating the experience with hopes to make the most of it, and having a great time while gaining lots of fitness to bring back to the states. None of us, besides Rod, knew what to expect in Brazil, or how the racing would compare to the States. I expected terrible infrastructure, dangerous and poor quality roads, and a dollar that stretched across the country. I was also worried aggressive riders would be forcing me off the road while guys with superhuman endurance dropped me within minutes of the start. It turns out, to my relief, besides the stretchy dollar, I was mostly wrong. The first day started in downtown Gravatai with around 100 riders under a hot sun at 9am. The stage was 180km long with rollers for the first half followed by a very flat and windy second half to the town of Torres. It should be noted each day was a point to point road race with a rolling enclosure so we could use the entire road. The start was very fast with numerous hard accelerations, and I was thinking if it stays like this I’m toast, for sure. Fortunately after about an hour the pace settled down and became quite manageable. Easy, even, though we were cruising at an average speed around 26mph. Once we hit the flat second half of the stage where we rode past wind farms along the Atlantic coastline, it was fairly easy to stay in the draft especially on the inside which was nicely protected by the wind. With about 30km to go the pace picked up to reel the break in, and it suddenly became very difficult to stay in the peloton. We were flying along at 30+mph for the last hour and for the last half hour steady attacks over 35-40mph kept me keep deep inside the pain cave. The sun was brutal with temps hovering in the 30C range, and I had a pounding headache to boot. With about 10km to go there was a fairly steep hill, and my legs were feeling good so I attacked up the hill. About 5 guys went with me and we stayed away for about 10 seconds from the peloton before easily being caught again. After that I decided to just coast my way to the finish safely inside the draft. The first day was long, and the high temperatures coupled with a sun continuously beating down upon me made for a tough start. After one day I was seriously wondering how I was going to do this for four more days. My experience with the peloton was excellent. The other teams were all South American with a few continental pro teams from various countries, and I was relieved to discover they are incredibly professional riders. 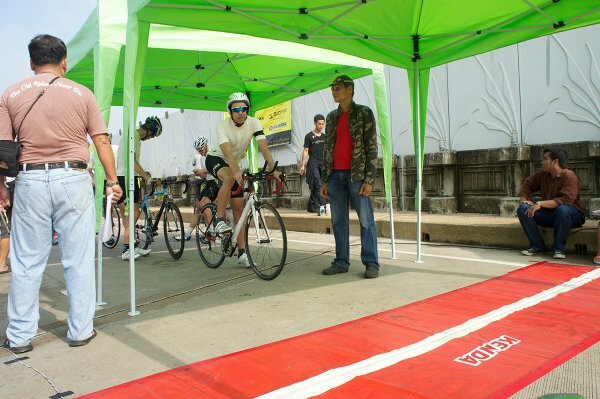 The vast majority have top notch bike handling skills, and are very polite and courteous. The hotel we stayed in was a resort on the beach, and was a great place to unwind after a long, hot day on the saddle! Results after day 1 - same time as leader besides the three sprinters who got time bonuses. Today we went for basically the same ride as yesterday but did a few 5' threshhold efforts. For the ride we were met by Doug, one of the GC contenders for both races. He got 2nd place last year at one of the races. I got a flat before we even made it to the highway. A small sliver of metal pierced right through the tire and tube! Being comfortable now with the extreme conditions I managed to snap a few photos. Yes, it's actually an interstate with speeds as high or higher than the US. At one point a police vehicle pulled over in front of us with the lights on causing us to panic, but they were just getting out to collect a orange cone on the shoulder of the road and didn't even glance at us as we illegally rode by! At least we weren't alone. Yesterday I flew to Florianopolis, Brazil from NYC for two 5 day stage races. The first leg was to Sao Paulo. A fun nine hours on the plane, a short layover, and then an hour hop to my final destination. I was greeted by my teammates around midnight and learned one of their bikes never showed up, and was stuck in customs somewhere in Brazil. We spoke with the airline management then headed to the hotel. A quick beer, sleep, and today we hit the road in our giant van which easily handles all our gear. We are living like pros these days. Free room and board, a mechanic taking care of our bikes, a driver and touring van, and tomorrow we pick up a rental car to trail us each day at the races. 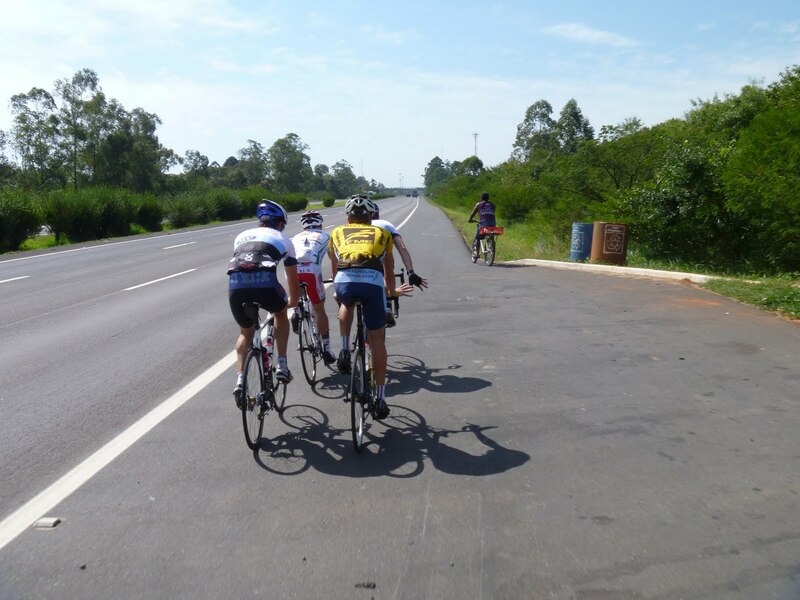 Today we drove about 6 hours south to Gravatai, Brazil to be near the first stage race which starts on Wednesday. Hot and sunny, beautiful, very green scenery with an ocean view to the east the entire drive, the six hours flew by. We broke up the drive and stopped for lunch at a road side churraceria bbq where we pigged out on grilled local beef and pork and a buffet bar. We arrived in Gravatai in the early afternoon, built the bikes, and hit the road. I brought my camera along but quickly realized a photo op was not going to happen. A video game featuring road cyclists began, and unfortunately we only had one life. 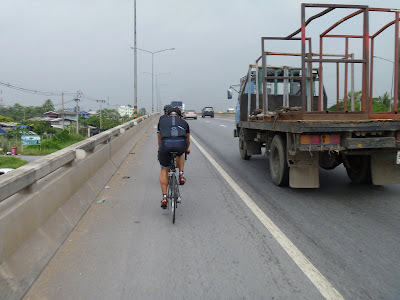 Immediately upon leaving the hotel, chaos ensued, huge trucks buzzing by with no shoulder, cracks that eat tires for lunch, and potholes that were perfectly sized to swallow wheels and maybe even the cyclist. Our training ride took part mostly on the Interstate where it’s illegal to ride bikes. According to our Brazilian teammate this was the best option and also the safest since it has a shoulder. Loud and constantly being passed by semi’s, I eventually found the zone and got a good workout. The road was perfectly flat and straight so it was very easy to pound away on the pedals at a constant pace. It felt great to open the legs after so many hours of travel! Then I got a flat tire. A quick change, and we turned around to head to the hotel. About 3/4th the way back we decided to take the rural roads for the remainder of the ride. Highlights include Al drafting a car worth about 1/4th the value of his bike, a few wild horses eating grass inches from the road looking at us like we definitely did not belong, witnessing shacks with nothing but a TV and 6 people living in them, roads that make Paris-Roubaix look easy, people and bikes going in every direction while inches to the left bumper to bumper cars were fighting their way home. The power maybe was inconsistent but the heart rate was pegged! We shall see what tomorrow brings us. Hopefully a few pictures to accompany the words!